Jump into the wild, wild, west with the Origins Award winning game that puts YOU in the boots of a Western Gunfighter. Join Gutshot co-creator Mike Mitchell for an exciting game that will playtest some new rules to expand on our current system. 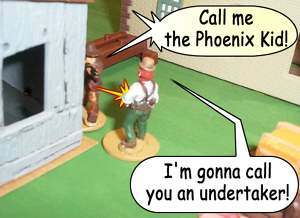 The game could include anything from a Spaghetti Western to a Six-Gun Zombie Apocalypse. You won't know what it is until you get there, but we guarantee it will be fun! So, we'll see yuh there pardner... if yuh got enough true grit to get Gutshot! Visit www.hawgleg.com for info.